I can honestly say that wedding dress shopping was the first thing on my to-do list after Hunter popped the question. I definitely recommend figuring out a few other things (like date, venue, budget) before you dive into shopping, but what can I say? I was a little excited and my sweet mom had already made me an appointment at a precious shop in my hometown...so I jumped the gun a little bit. I had the best experience ever, but I am here to make sure that yours is even better. 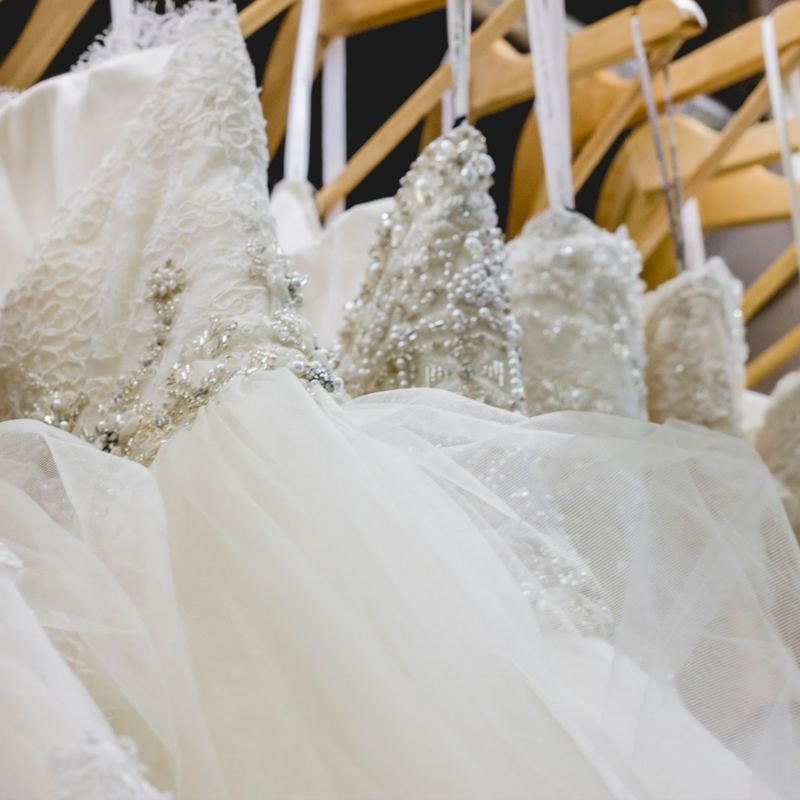 I've come up with a list of several things you should do before you shop that will make it even easier for you to find the dress of your dreams! This part isn't necessarily fun, but it bares mention. Have a price range of what you are willing to spend. Avoid trying on dresses that are outside your range. Simple as that. Look into the average prices of dresses at a shop before you make an appointment. This way, you know that there will be lots of options that are friendly for your budget. This will determine the style of dress that you are looking for. A family beach wedding calls for something entirely different than a large church wedding. I knew that my wedding would be in Starkville at my church, so this was an easy decision for me. You also want to know the time of year that you will be getting married. You wouldn't want to get a dress with thick sleeves if you are getting married in Mississippi in the heat of the summer. So having a general idea (or better yet, an exact date!) will ensure that your dress is appropriate for the season and, of course, comfortable for the weather you'll be in. I think it can be helpful to have some ideas about the color you would like your bridesmaids to wear when you are going into your appointment. If you aren't set on a certain color then don't worry about this part. But, if you have always dreamed of having your bridesmaids wear gray, then a buttery, creamy wedding dress may clash a little bit. This is just something to have on your radar as you are selecting a shade for your dress. Of course, your consultant can help you figure out a color that suits your interests! This seems simple but it will be a great way to help your consultant know what styles to show you. Always be open to trying on things outside your comfort zone, but don't be afraid to speak your mind about styles that are totally off limits or that you love! Here's a guide to help you learn the lingo. Giving a list to my consultant at It's a Date made my options soooo me. This dress was one of my favorites. Although I didn't end up picking this one, I loved it and it helped lead me to the dress that I ultimately chose. One thing I wanted was a dress that I could dance in. Hunter and I plan to tear up the dance floor (make your reception song requests here) so I have to be able to move! The main reason I did not choose the dress I showed you above is because it wasn't as secure up top as I would have liked. I was worried that I would be pulling it up all night. Another one of my favorites had cap sleeves. These weren't suited for me because I couldn't lift my arms above shoulder height. With a groom that is a full foot taller than me, I knew this wouldn't work! Think about how the dress moves. Can you sit? Can you pee? Can you dance? Can you hug your groom? These are all things you'll need to do in your dress! Up or down? That is the question. If you have dreamed your whole life of a gorgeous up-do, tell your consultant that! She may pull some gowns with interesting straps, necklines or backs that can be showed off with your hair pulled back. If you want your hair down, she should know that too. Of course, none of this has to be set in stone, but general ideas with help you visualize the whole look. I think it changes your entire experience if you go to the store with a full face of makeup, your hair fixed and a tan. I got a spray tan, did my makeup and made sure my frizz was (decently) under control. This way, I could see what my tan looked like against certain shades of white since my wedding is in the summer, but I dress shopped in the fall. These are small details, but I think they help you have a better picture of what you would look like on the actual day. Most importantly, remember that your wedding day is YOURS. Consider the opinions of family and friends who go with you, but make your own choice. You are beautiful inside and out, and this dress should make you feel that way!